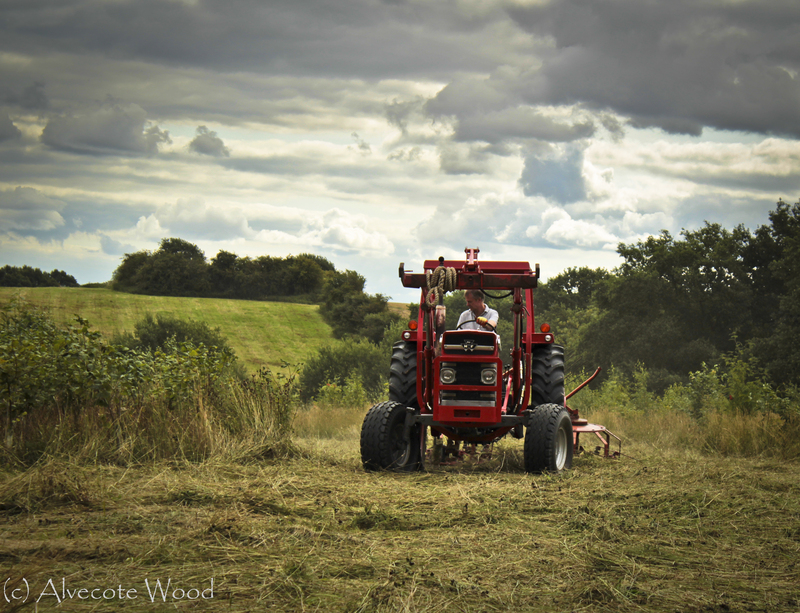 Haymaking. Something we have never done before. So why are we doing it now? And what does it involve? We have been trying to get wildflower meadows established in the clearing at Alvecote Wood, as well as in three large meadows that will remain wildflower meadows when Betty’s Wood has grown up around them. It is not as easy as you might think. It isn’t just a question of chucking down a bit of seed and ending up with a beautiful wildflower meadow. The problem is with the soil fertility. 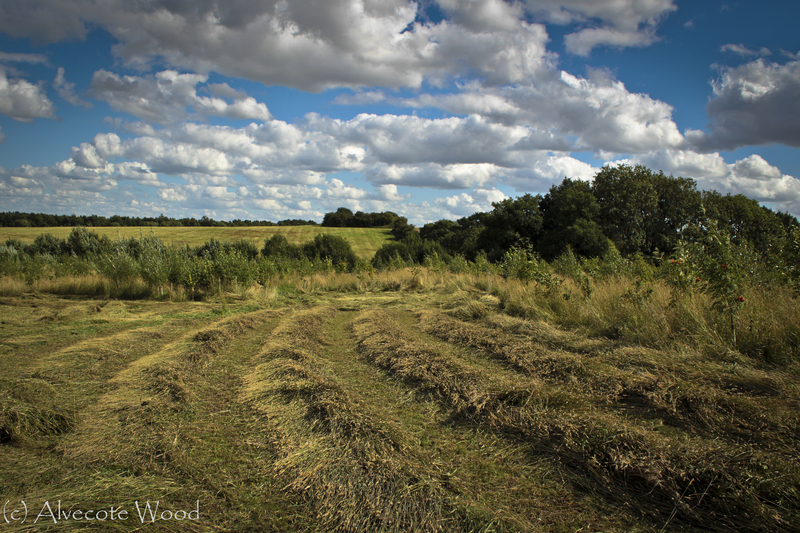 The clearing at Alvecote Wood was for years used for animal grazing, and is highly fertile. Betty’s Wood was, until 2010, an arable field that was regularly fertilised for the benefit of the crop. Spreading the Hay to help it dry. The problem is that fertile ground promotes the growth of grass at the expense of wild flowers with the end result that they are crowded out by tall grass. There are a few things you can do. One of them is to plant yellow rattle in the wildflower seed mix. This is a semi-parasitic plant that feeds on grass, stunting its growth and allowing wildflowers to grow. We have done this, but the growth so far is patchy, which results in some areas showing good wildflower growth and others being overwhelmed by grass. 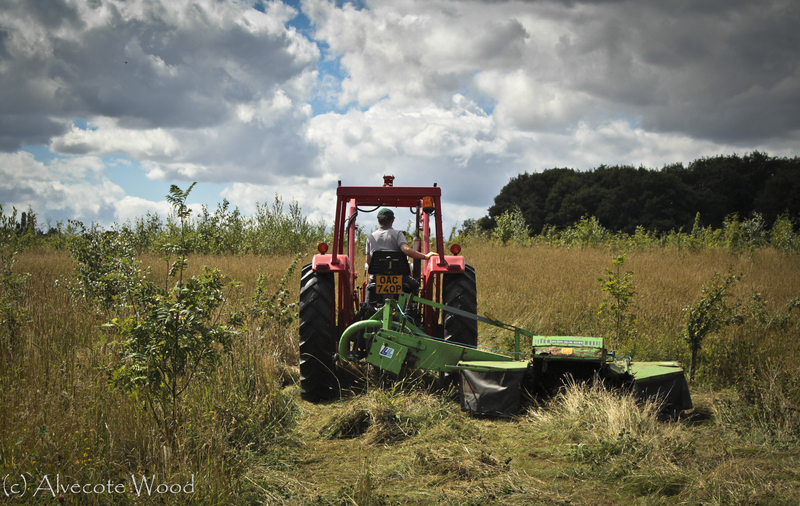 In 2011, the first year of our meadows, we had hardly any growth because of the drought. So we just used our mulching mower to take out the top, and this didn’t cause a problem. Last year, however, the rain gave very lush growth. The problem is that access for contractors to our meadows is poor, modern equipment being too big to pass through the mature woods on the way to the fields, and the meadows are too small by modern standards (about 3/4 acre to 1 1/2 acres each) for modern equipment to cope with. We ended up having to use the mulching mower because we simply couldn’t find anybody who could mow and bale for us and in places this year the meadows suffered for it, showing lush grass growth but relatively poor wildflower growth in some places. We had clearly reached a fertility tipping point and this year it was critical that we got the hay mowed, and took the cuttings off, since this means the hay doesn’t rot down and return the fertility to the soil. Between the trees, we are leaving a mulch as this helps the trees to grow, but in the meadows, we need to reduce fertility to suppress grass and encourage wild flowers. Inevitably this meant a trip to eBay for the equipment, and even then, we needed stuff that our old tractor could cope with. 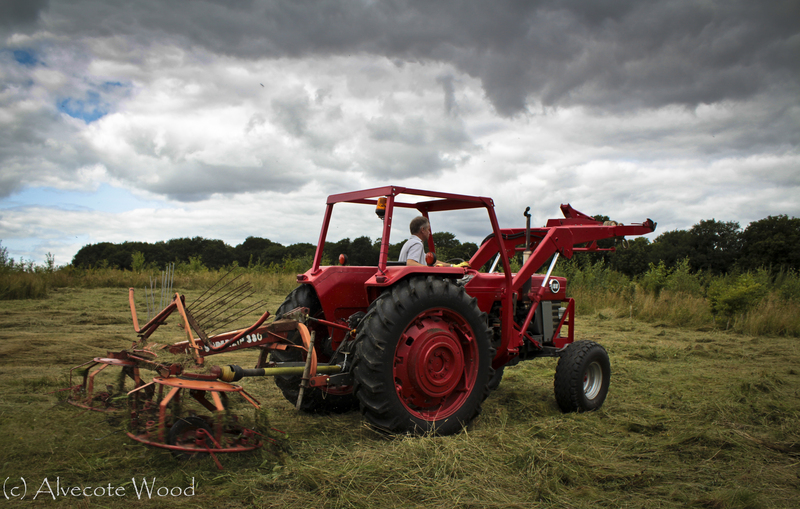 Eventually we came up with the goods, and after taking a punt on a non-working mower that was due to be scrapped, we managed to get it working again, and set about haymaking. But how to do it? A lot of modern haymaking is almost all grass, in big fields, creating large round bales that can be used for animal feed. This is often done relatively early in the year so that animals can then graze the stubble. Wildflower hay is different – it needs to be made after the wildflowers have set seed, and after the butterflies and moths have finished using it, and the birds have finished nesting there. In short, in late August, rather than June or July. We also needed to produce square bales for sale as horse feed, as this is more convenient for the smaller user of hay and were fortunate to find a suitable small square baling machine. We sought as much advice as we could from farmers old and young, and read all the manuals, watched YouTube videos, and prepared as well as we could. But when it came to it, we were on our own. We decided with a good weather forecast this week, only an outside chance of a shower, we should get on with it. Wind rows – what the mower produces on first cut. First of all, we used the drum mower to cut the hay. We were amazed at the lovely close cut that you got, and thankful that our slow old tractor gave time for the voles to get out of the way. The hay was all gathered up into lovely wind-rows, but we needed to get it properly dry. For this we used the hay-bob. This has two settings – spreading, and collecting. We used it to throw the hay up into the air, scatter it over the ground, and aerate it, promoting good drying. We will need to do this for one or two more days before baling. That is another skill we need to learn! What the photos can’t show you is the absolutely astounding and beautiful scent of wildflower hay. It is warm and sweet, and I can honestly see why animals love wildflower hay. It has a completely different smell to grass, which can smell a little bit bitter. I carry the scent home with me in my nostrils, although some of it is down to the bits of hay left in my hair too, after a morning in the fields. We are using a hand rake to bring the hay in from the edges close to the trees, so it all dries properly and can be collected. We hope we will end up with lots of lovely sweet, dry bales that we can sell to offset the costs of making them. It is really exciting. Our first hay-making! All we need now is lots of people to help us stack the bales and get them under cover once they are made. I’m sure there will be lots of help. 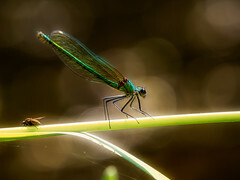 At the end of the day, this is about the wildlife and making our meadows as diverse and rich as possible to benefit the flowers, and those creatures that depend upon them. Part Two should feature baling, weather permitting! 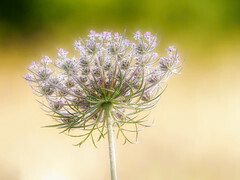 This entry was posted in Our News, Photography and tagged Conservation, Grass, Hay, haymaking, Meadow, Nature, Wildflower, wildlife, yellow rattle. Bookmark the permalink. Pingback: Wake Up And Smell the Hay!